Ocean weather, never a dry topic, is getting more interesting - we have a High, we have a Low, which way to go, don’t you know? The North Pacific High is established and centered at about 43N 155W. It’s strong – about 1036mb – which is good, and about 600-800nm in diameter. There is a Low developing about 500nm West of Vancouver Island. A squeeze zone should develop between the High and the Low. Interesting! The High is forecast to drift West while the Low is forecast to move SE and should be affecting the fleet from about Tuesday evening (tonight) through to Thursday morning. Most boats should see sustained wind speeds in the 15-25 knot range, while some may see up to 30 knots, bordering on gale force. 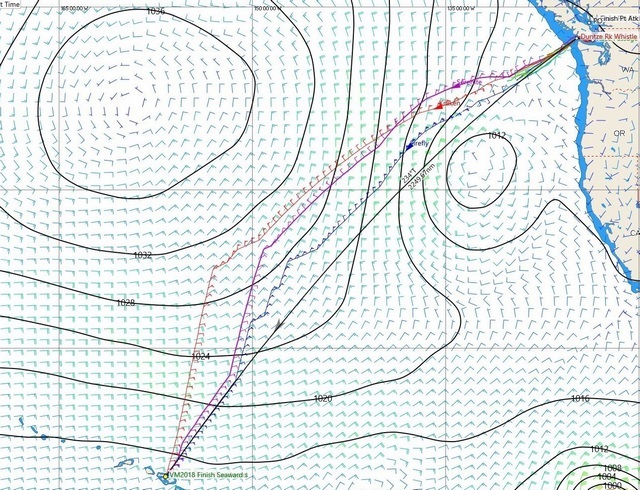 Wind angles will change as the Low crosses the track, leading to a flurry of sail changes, and once settled the angles should be behind the beam and very favorable for fast sailing. Fast! 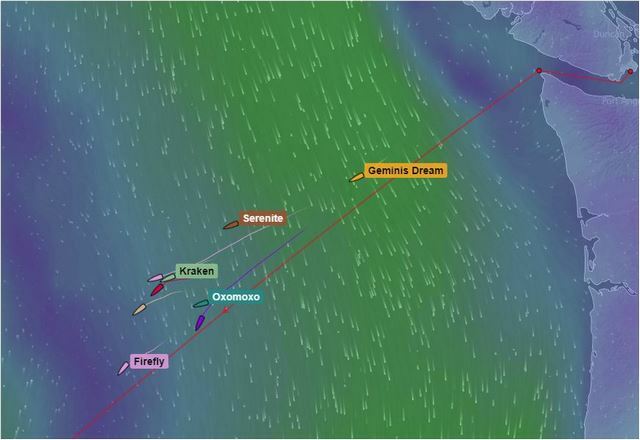 The fleet is currently sailing very close to the rhumb line, the shortest route to Hawaii. Shortest, but not necessarily the fastest. The High is likely to move farther West than usual, and combined with the Low it will be very attractive for the fleet to sail West of the rhumb line. Risky! This is not the textbook route to Hawaii! The risk of being West of the rhumb line is getting swallowed up into the middle of the High if/when it comes back to its usual position. There is little to no wind in the middle of a high. On the other hand, trying to go East of the rhumbline means beating into the Low and possible light and variable winds when it dissipates. So the navigators will be thinking this routing decision out carefully. And there is always the possibility, nay, probability, that the actual weather will be different from the expected weather. A conservative strategy might be to sail on the favorable side of the low, stay as close to the rhumb line as practical, sail less distance, stay in the squeeze breeze, and take less risk of getting becalmed. Sounds easy! Beyond the next few days and the passage of the Low, the trade winds ahead are looking good. Off to the Southeast, there is some tropical system activity to keep an eye on, with TS Emilia reportedly dissipated and TS/Hurricane Fabio strengthening and forecast to dissipate before affecting the Vic-Maui fleet’s probable track to Hawaii. One eye to weather! Caveat: this article and the images are presented for informational purposes – they are not predictions of or advice to any boat regarding weather or routing! Aloha from aboard Salient! Your writer is strapped in the navigation seat which is on the starboard side of the boat. With a strong westerly and us going on the rhumb line towards Maui a solid strap is required to avoid getting catapulted onto the stove top. Not something anybody would enjoy much! 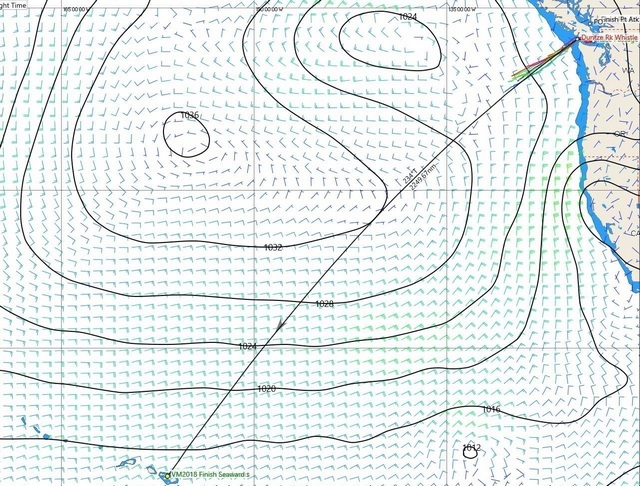 After an amazing start into the 2018 Vic-Maui race with lots of wind and sun we are now power reaching under a partly sunny sky, with strong winds (20 – 25 kts, gusting 28). Not that much wind really but combined with a light cruiser/racer and the ocean swell and waves this makes for an exciting ride. Below deck it feels rougher than on deck. Thanks to webbing straps on the ceiling we manage to move about relatively safely. But most of us have some bruises to sport. Food is delicious but mostly ignored or fed to the fish one way or another. The winner is the box of breakfast cookies prepared by Susan Tresa – the only thing that most seem to enjoy at the moment. On deck it is rock and roll. We are having fun playing with the waves as we try to weave our way through the troughs without smacking strait into walls of water. Sometimes we miss: Standing at the helm one minute I see the yellow hoodies of our crew and the next moment there is only a wall of white water crashing into the cockpit. Next thing I am almost a foot deep into water. Everybody laughs and on we sail. After a bumpy ride at night and early morning, the winds eased off a bit and we are no longer seeing the high gust. The cockpit crew still gets frequent showers and they told me to mention conditions are moist. With crew of eight, four are on watch and four on rest. During the day we stand six hour watches and at night four. We are now already on Honolulu Standard Time and it is 2 pm as I am writing this. Until tomorrow! – Salient out.